Cranial Cruciate Ligament Rupture (CCL) is a very common problem in canine patients. The cranial cruciate ligament of the stifle (knee) joint normally serves to connect the femur (thigh bone) to the tibia (shin bone) in a way that prevents the tibia from shifting forward during weight bearing. The cranial cruciate ligament also provides rotational stability to the knee. The cranial cruciate ligament is similar to the anterior cruciate ligament (ACL) in humans. Rupture of the cranial cruciate ligament may occur from a sudden traumatic event, but usually results from gradual, progressive tearing of the thousands of individual fibers. Dogs who suffer from the gradual failure of the CCL are at a 50% risk of eventual failure of the CCL of the opposite knee. Even if there is not a complete rupture of the ligament, chronic partial CCL tears usually result in moderate persistent lameness, progression of osteoarthritis and muscle atrophy, and will often lead to a full rupture if not treated. Conservative non-surgical treatment consisting of pain control and joint support is an option in certain circumstances (financial, health concerns), however surgical intervention tends to yield a faster and more predictable outcome. All dogs that rupture their CCL will develop some degree of osteoarthritis. However, with appropriate and timely treatment most dogs will recover comfortably and with excellent use of the limb. Surgical repair for partial or complete tearing of the cranial cruciate ligament (CCL) is recommended to curtail the speed and progression of osteoarthritis, prevent additional injury, and to try to restore normal function as quickly as possible. Tearing of the cranial cruciate ligament leads to instability and abnormal motion in the knee or stifle joint, which lead to pain, arthritis, cartilage loss, and further degeneration of the joint. Intracapsular techniques in which the course of the natural ligament is mimicked inside the joint. Intracapsular repairs are designed to recreate the cruciate ligament and mimic the current repair strategies used in humans. These repairs in dogs have had, and continue to have, unreliable outcomes and prove that canine cruciate ligament disease is not the same as human disease. Extracapsular repair (lateral fabellar repair), is a procedure in which an implant is used to allow the body to produce scar tissue in a controlled fashion to stabilize the joint. These methods include the lateral fabellar suture technique, fibular head transposition, and the “tight rope” procedure. TTA and TPLO- These are osteotomy (bone cutting) or "geometry altering techniques" that use your pets normal weight bearing to biomechanically stabilize the knee. TPLO (tibial plateau leveling osteotomy) and TTA (tibial tuberosity advancement) use precise cuts in the tibia (shin bone) to change the natural forces of the knee and eliminate joint instability during natural weight bearing there by significantly decreasing the progression of joint damage. One of the most important parts of cranial cruciate ligament repair surgery is assessing and managing the 2 menisci. The menisci are "cushions" between the femur and tibia. Although most of the attention is placed on the medial meniscus since it is more often grossly damaged, reports have indicated that there is trauma and disturbances to the lateral meniscus as well. Most major meniscal damage (bucket handle tears, maceration) occurs with a complete tear of the cranial cruciate ligament however we frequently see abnormal menisci in stifles with partial tears. There is continuing debate as to how to correctly manage the meniscus. If there is gross damage or tearing, a meniscectomy, or removal of the damaged meniscus, must be performed. Some surgeons choose to perform a total medial meniscectomy, whereas some prefer to only remove that portion that is torn or damaged. Work is ongoing, but there are currently no good methods for repairing or replacing the canine meniscus. The medial meniscal release, which is sometimes performed, is a procedure by which the medial meniscus is cut from its attachments. This allows the caudal pole (or most commonly damaged part) of the meniscus to slide out of the way of the medial femoral condyle during cranial tibial thrust. The TTA approaches the cranial cruciate deficient stifle from a biomechanical standpoint, and attempts to neutralize the abnormal forces that result. The theory of the TTA is that all normal joints are in equilibrium with equal forces pulling the joint in each direction. In the stifle the only force supporting cranially is the patellar ligament. If the patellar ligament is perpendicular to the tibial plateau then all forces are equal. The goal is to eliminate the tibial shear force and decrease instability and thus decrease the progression of osteoarthritis. The TPLO (shown later) accomplishes this by moving the plateau, the TTA works by moving the patellar ligament. By advancing the patellar ligament, it is reported that all reaction forces in the stifle are decreased including patellar femoral force and femoral tibial force. It is thought that these forces lead to excessive stress on the articular cartilage, leading to osteoarthritis and chondromalacia. A TTA plate is contoured to the proximal medial tibia and an osteotomy is performed to free the tibial tuberosity and patellar ligament insertion form the tibia. A spacer or “cage” is used to advance the tuberosity. The cages come in many sizes and the appropriate cage is placed at the osteotomy site. Custom titanium implants are used to secure the cut section of bone. All of the TTA implants are made of Titanium, which is reported to be much less reactive than stainless steel. A bone graft is applied to the defect created by the advancement. 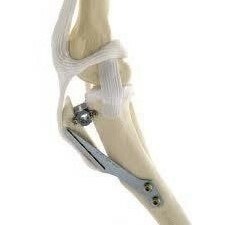 The advantages of the TTA include decreased overall joint forces, no manipulation or distortion of the collateral ligaments, and no cutting of the weight-bearing surface of the tibia. The TTA is quite versatile and also offers the ability to correct a medial patellar luxation by transposing the tibial tuberosity laterally during implant application. Postoperative care consists of exercise restrictions and controlled walking during the healing period to allow for a trouble free recovery. Activity must be controlled until there is bony union at the osteotomy. This usually takes 8-12 weeks in most patients. Flexion and extension exercises and ice packs can begin 24-48 after the surgery. Short controlled leash walks of 5-10 minutes are encouraged. A recheck is performed in 10-14 days to assess the incision and soft tissues and to assess limb function. Most patients are using the leg anywhere between 1-14 days post operatively. At 2 weeks physical therapy including more aggressive flexion and extension activities and longer slow controlled leash walks are encouraged. We typically recheck again at 8 weeks post-operatively for radiographs to assess healing of the osteotomy and to make any necessary changes to the physical therapy plan. Usually at this point, 20-30 minute walks are encouraged with short sessions of light jogging. A slow return to function over the next 8 weeks ensures a gradual loading of the osteotomy and encourages strong bone formation. Obviously uncontrolled activity, jumping, and falling can have devastating consequences that could possibly lead to implant failure or fractures of the tibia. The TPLO also stabilizes the knee by changing the forces that are acting upon the stifle. The TPLO addresses the instability by leveling the tibial plateau, and moving it to meet up with the forces. This is depicted below as where the tibial plateau is depicted by the hill. In the TPLO the top of the tibia or tibial plateau is rotated and stabilized with a plate and screws to hold the newly positioned tibial plateau in the new position to allow for the bone to heal.